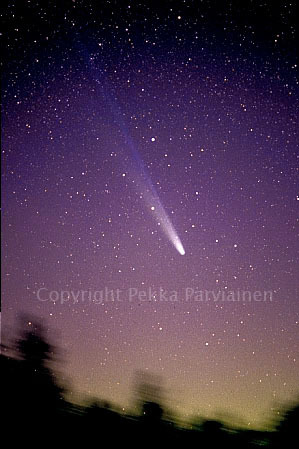 In 90's we were blessed by two gorgeous comets; having seen Hale-Bopp one can with some certainty claim that he or she has seen the comet of his or her life. 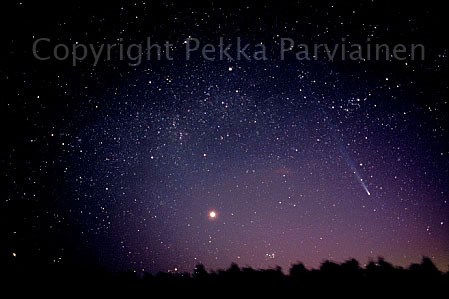 Images of Hyakutake are on the first two rows while the rest is of Hale-Bopp. 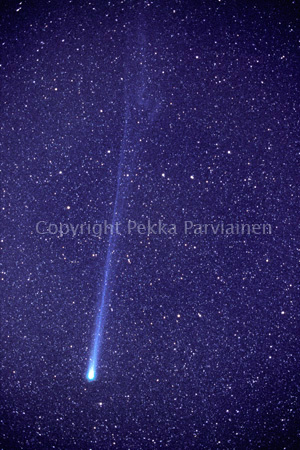 Hyakutake was at its best in late March 1996: in the night 23/24 the tail was visually 30 degrees long and in the night 26/27 40-45 degrees long. The sight was most impressive! 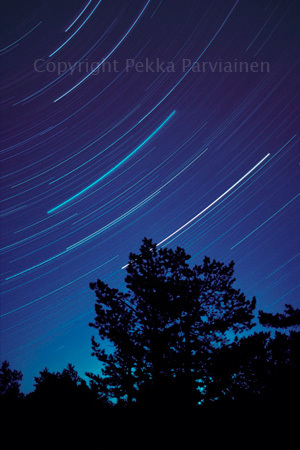 Note the two hour startrail picture of Hyakutake (ko01123). 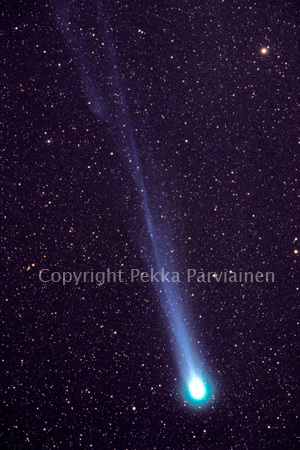 This comet was moving so fast that its trail is not in line with stars. When I first saw these trail pictures I was puzzled: films stay in cameras over winter and this speciality was forgotten by the time film was developed. (You understand: filling a 36 frame film with exposures of 2-9 hours each isn't done in one night; actually films are loaded in autumn and removed early in summer.) 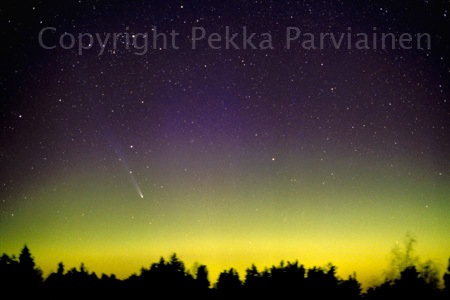 Hyakutake's movement was so fast that it was possible to take stereo pictures of it; pictures only an hour apart did show weak 3D while the tail hadn't changed too much. 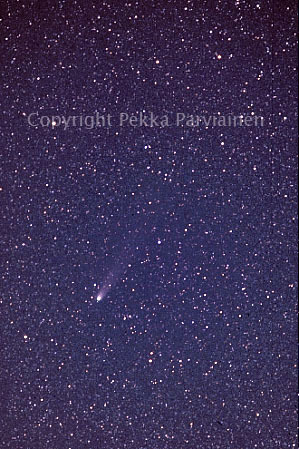 Compare Hyakutake's trail with that of Hale-Bopp's. 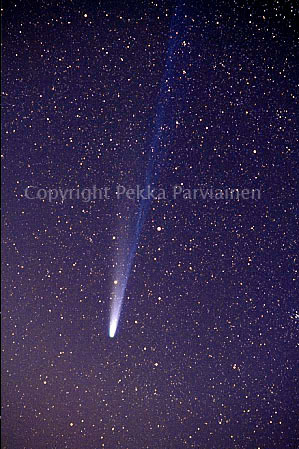 During Hyakutake's great appearance there were already rumours of something even better approaching us: Hale-Bopp had been discovered and was expected to give a grand show in spring 1997. 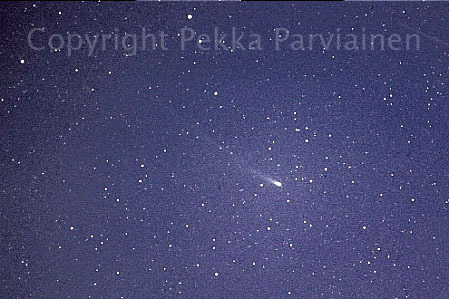 My first sightings of the newcomer were in 15/16 Sep 96 very deep in SW-horizon. 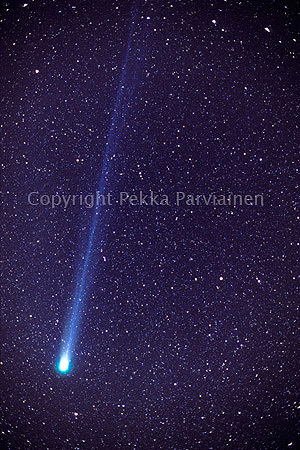 However, fighting with weather and moonlight did not allow any proper observing until in 14/15 Feb 97 (! 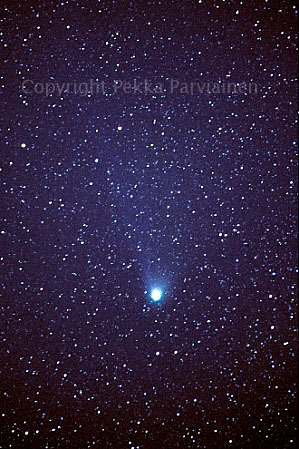 ); no apparent tail was yet visible to naked eye. 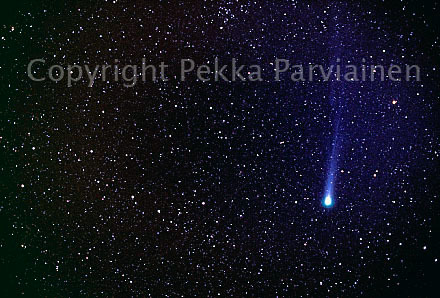 However, a couple of nights later - 16/17 - a 7-8 degree tail could be seen and suddenly expecatations rose significantly. Sure, the rest of the H-B-display is to be remembered by anyone who could observe this circumzenithal (at 60N and further in North) jewel descending down to northern treeline and again climbing up. 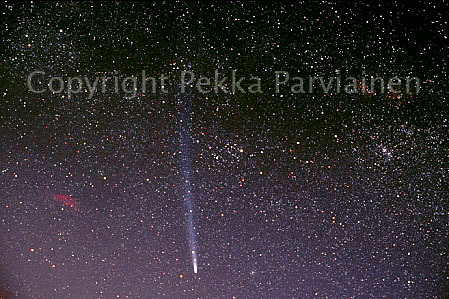 In late March and early April both gas and dust tails were around 10 degrees. Some of best obervations were 6/7 March with 12 degrees of gas tail and 7/8 April with 10 degrees of gas tail and 18 degrees of dust tail. 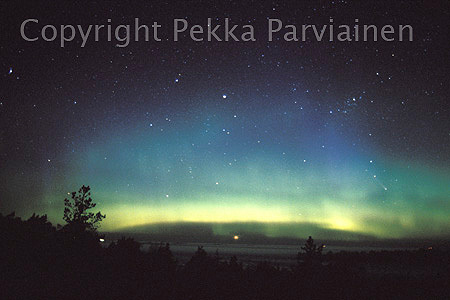 Some images on this page show weak aurora. 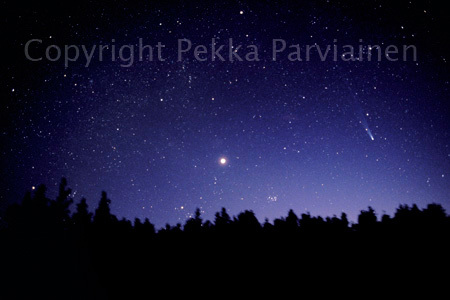 I hope to do new scans and composites of these images some time in future.